Vijayalalitha (Monica) Raghavan had no American education before enrolling at BCCE. Monica was not stressed about this on her first day. On the contrary, she was intrigued. “I wanted to know how education is different in America”, Monica said. It was this kind of curiosity and confidence in herself that lead to her enrollment at BCCE. 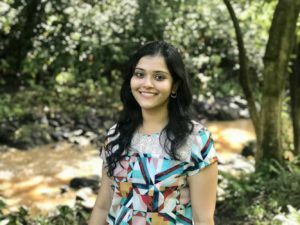 Hailing from India, Monica received a Bachelor’s of Engineering in Computer Science in 2014 and began a career in Quality Assurance. After working at a leading multi-national IT company, Cognizant Technology Solutions, she moved to Redmond and was working at as a QA for clients like Microsoft before moving to Amazon. While she knew a great deal, it didn’t take long for Monica to realize she had to learn more to keep up with the ever-changing tech industry. That’s when Monica began her research. After exploring other opportunities in tech, she chose UX Design as the specialty to transition toward. She began taking independent courses online, but the format didn’t suit what Monica was looking for. Monica enrolled in the UX Design Certificate Program and never looked back. She went on to complete the program and, before even completing it, began her new career in UX Design at Amazon. With no corporate experience in UX, Monica leaned on her work at BCCE, which made the difference. Monica’s experience at BCCE was the perfect springboard into her new role. She now works in Amazon Worldwide Ops designing tools for leaders to make decisions about associates in Amazon Fulfillment Centers. Monica had been on the job for 2 months when she completed her Capstone and received her certificate in March 2019. It was the final chapter in the story that was her time at BCCE. On top of her job, her portfolio and the certificate, Monica now has the insight for anyone who wants a career in UX Design. Monica was curious how American education operates before enrolling at BCCE. This intrigue, paired with her work ethic, has lifted her to a new career and in turn, a new life. “People tend to think they know what continuing education is. They think ‘you go to a class you meet the instructor three or four times, they grade you, do some assignments, and you’re done.’ It’s not like that. The instructors are very knowledgeable and tend to give you resources more than what they use in the class. When I enrolled here, I never thought of it as continuing education. I thought ‘I’m going to college’”. Learn more about our UX Design Certificate Program and register today!